FAIRBORN — Wright State University music students will learn directly from one of America’s most popular classical artists when Misha Dichter visits the university as a Distinguished Visiting Artist in Residence. Dichter will give a master class 1:30-3 p.m. Wednesday, Oct. 10, followed by a question-and-answer event from 3 to 4 p.m. in Schuster Hall in the Creative Arts Center. Both events are free and open to the university community and public. Jackson Leung, professor of music and coordinator of keyboard studies, described the program as a once-in-a-lifetime opportunity for students to engage with a virtuoso pianist like Dichter. “It will be really inspiring for our students to have this opportunity to interact with an artist of that stature,” Leung said. Dichter’s visit is presented by CELIA, Wright State’s Ohio Center of Excellence for Collaborative Education, Leadership and Innovation in the Arts, and the School of Music, in collaboration with the Dayton Performing Arts Alliance. The master class will be organized like a public lesson, with Dichter commenting on each student’s performance for their benefit and the audience’s. Leung will lead the Q&A session during which students, faculty members and teachers can ask questions of Dichter. The program will appeal to all music students, even if they do not play the piano. Students can still learn from the interpretation of the music and the ideas and advice Dichter will provide, Leung said. “That would benefit any music student,” he said. Dichter was born in Shanghai to parents who fled Poland at the outbreak of World War II. His family moved to Los Angeles when he was 2 and he began studying the piano at 5. As a student at the Juilliard School in New York City, he won the Silver Medal at the 1966 International Tchaikovsky Competition in Moscow, launching an international career that has spanned six decades. He has performed works from almost all the major composers and with almost every major orchestra. His recordings of the complete Franz Liszt Hungarian Rhapsodies and the Liszt Piano Concertos helped set the standard for other performers worldwide. 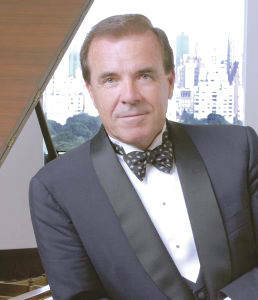 With his wife, pianist Cipa Dichter, he has toured North America and Europe, presenting both masterworks and neglected scores of the two-piano and piano-four-hand repertoires. He also conducts widely attended master classes at major conservatories, universities and music festivals, including Aspen, Curtis, Eastman, Harvard, Juilliard, Yale and Holland’s Conservatorium van Amsterdam. Dichter received the Grand Prix International du Disque Liszt in 1998 for his recording of Liszt’s piano transcriptions. In addition to visiting Wright State, Dichter will perform in concert with the Dayton Philharmonic Orchestra at the Schuster Center in downtown Dayton on Oct. 12 and 13.